The Original Be Nice. 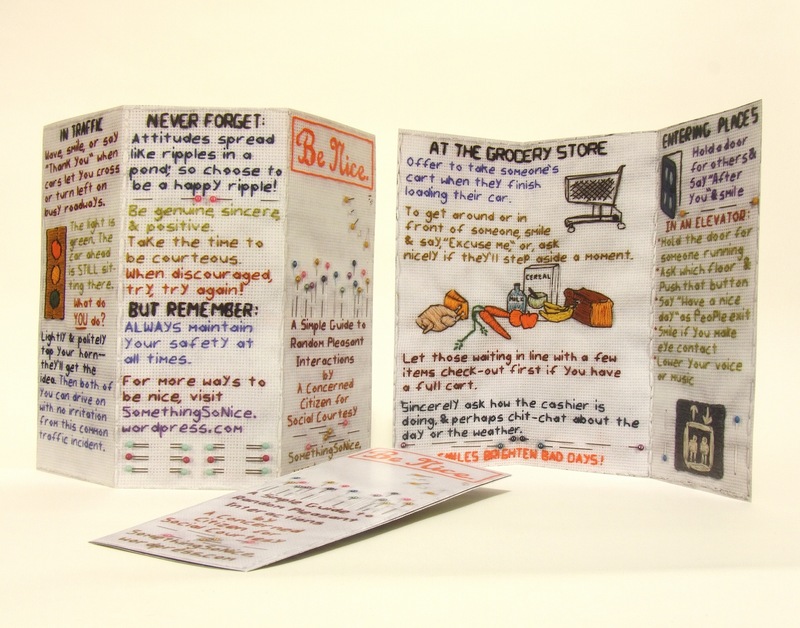 Brochure | Be Nice. Below are jpegs of the actual Be Nice. piece. It is an original work that I embroidered on a one-to-one scale with the reproduced pamphlet. The order of the pages as they unfold in the pamphlet causes the images below to appear out of order. 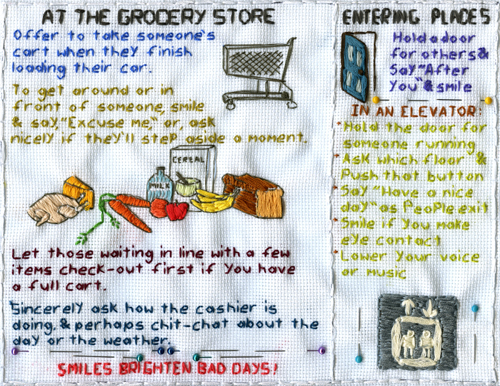 The intended order, based on the headings, are: Be Nice., At the Grocery Store, Entering Places, In Traffic, and Never Forget. Copyright ©2008. Jennifer Hunold. All Rights Reserved. This image shows pages 2,3 and 4 of the printed pamphlet. Your many comments about being nice are heartwarming. Yesterday, walking my dogs in the snow here in our neighborhood in Southeastern Michigan, I noticed a just-cleaned driveway, a man leaving that drive and rolling his snowblower down the street to his home, and a woman leaving that drive and tiptoeing, shovel in hand, to her own back entry next door. The two waved happily in farewell but didn’t speak. I surmised that they had just cleaned the drive of a neighbor who might be elderly or ill, and it was to be a surprise. Witnessing this little scenario gave me a warm glow of heartfelt appreciation for the rest of the morning. I also notice that walking my two greyhounds (twice a day unless the weather is reeaally bad) lets me encounter lots of neighbors who are always so courteous, kind and friendly. There is something about being out and about in my neighborhood that encourages old-fashioned niceness. Even though we’ve only been here for six months, I feel welcomed and that I’m part of the community. Thanks for your blog on this important but often overlooked subject! Pingback: Be Nice: a selfish act? 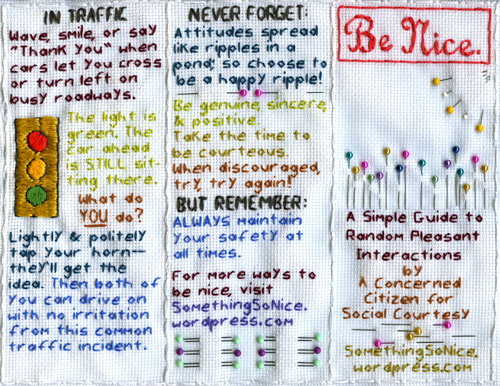 « Be Nice. cool website,maybe you could have a be nice on talking to crushes. Thanks Muse. I’ll try to do a post on that in the next week. Thanks for stopping by!